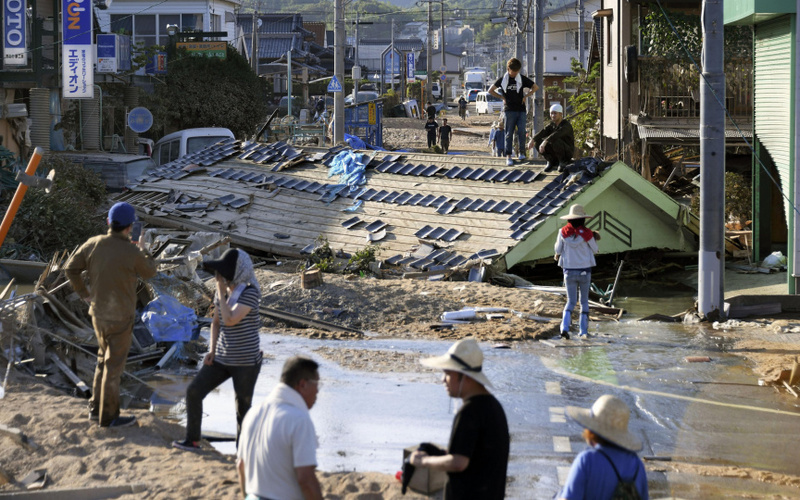 HIROSHIMA, Japan (AP) — Rescuers combed through mud-covered hillsides and near riverbanks Tuesday to look for dozens of people still missing after days of heavy rains caused flooding and mudslides in southwestern Japan, where the death toll has risen to 122. Officials and reports say more than 80 people are still unaccounted for, many of them in the hardest-hit Hiroshima area. The Fire and Disaster Management Agency said 122 people have been confirmed dead as of early Tuesday. Several days of heavy rainfall that weather officials have called historic set off flooding and landslides in widespread areas of western Japan, including Hiroshima, Okayama and Ehime prefectures. Many people started to return and check on their homes and begin cleanup after the rain stopped Monday. The government has set up a taskforce to speed up deliveries of supplies and other support for evacuation centers and residents in the region, but disrupted roads and other ground transportation have delayed shipment, raising concerns of shortages. Minoru Katayama, 86, rushed back to his home in Mabi city, in Okayama prefecture, on Monday, and found his 88-year-old wife, Chiyoko, dead on the first floor. Floodwaters rose so fast they caught the couple by surprise. "My wife could not climb up the stairs, and nobody else was around to help us out," Katayama told national broadcaster NHK. His wife was among more than 20 people who were found dead in the city, where a river dike collapsed. The assessment of casualties has been difficult because of the widespread area affected. Officials in Ehime prefecture asked the central government to review a weather warning system, noting that rain warnings were issued after damage and casualties were occurring. The Japan Meteorological Agency said as much as 10 centimeters (3 inches) of rain per hour fell on large parts of southwestern Japan. Thousands of homes were without clean water and electricity in Hiroshima and other hard-hit areas, where many people lined up for water tanks under the scorching sun, with temperature rising as high as 34 Celsius (93 Fahrenheit), which prompted concerns about people's health. Thousands have evacuated their homes. Prime Minister Shinzo Abe canceled his planned July 11-18 trip to Europe and the Middle East to oversee the emergency response. Abe said earlier Monday that the government had dispatched 73,000 troops and emergency workers for the search and rescue effort.